A native of Loranger, Brig. Gen. Rodney B. Painting received his commission from Officer Candidate School in 1989. He’s had multiple command and staff positions within the 205th Engineer Battalion, 61st Troop Command, 225th Engineer Brigade, and Joint Force Headquarters. His command and leadership positions include platoon leader, company commander, and operational detachment level through brigade. Serving as commander of the 205th from 2004 to 2010, the battalion was tasked with the monumental cleanup following the devastation brought by Hurricane Katrina as the lead effort for the entire Northshore region. In 2010, he became the 225th Deputy Commander, working closely with the US Coast Guard and employing the use of the 2225th Multi Role Bridge in vacuum barge operations following the Deepwater Horizon Oil Spill. As commander of the 61st Troop Command from 2011 to 2012, the unit trained and gained NGB certification as the Nation’s newest CBRN Enhanced Response Force Package (CERFP). In 2012, he assumed the reins of the 225th Engineer Brigade and during the next four years, the Brigade saw nearly 55% of its Soldiers forward deployed. Since 2016, he has served as the J2. His operational deployments include multiple ODTs to Panama, Honduras, Belize, Norway, and Germany. 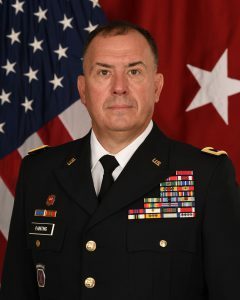 In 2003, serving as the S3 for the 205th, he commanded a forward deployed detachment, including multinational forces, providing direct engineer support to 1st Brigade, 10th Mountain Division in Kandahar. This element was responsible for all engineer operations in southern and eastern Afghanistan; including the mountainous border with Pakistan, supporting 9 forward operating bases in CJTF 180’s fight on terrorism. His education includes a Bachelor of Science in Secondary Education from Louisiana State University and a Master of Strategic Studies from the US Army War College. He is currently the Director of Business and Resource Development for the Louisiana National Guard, charged with increasing public private partnerships and creating additional self-generated revenue for the Soldiers and Airmen of LANG. Brig. Gen. Painting and his wife Monica have been married for 27 years and have three daughters; Thea, Brendyn and Kobi. They currently reside in Amite. His awards and decorations include the Legion of Merit; Bronze Star Medal; Meritorious Service Medal with 2 Bronze Oak Leaf Clusters; Army Commendation Medal with 1 Bronze Oak Leaf Cluster; Army Achievement Medal; Army Reserve Components Achievement Medal with 1 Silver Oak Leaf Cluster & and 3 Bronze Oak Leaf Clusters; National Defense Service Medal with 1 Bronze Service Star; Global War on Terrorism Expeditionary Medal; Global War on Terrorism Service Medal; Armed Forces Service Medal; Humanitarian Service Medal with 2 Bronze Service Stars; Armed Forces Reserve Medal with Gold Hourglass and M Device; Army Service Ribbon; Army Reserve Component Overseas Training Ribbon with numeral 5; Coast Guard Special Operations Service Ribbon; Louisiana Legion of Merit; Louisiana Cross of Merit with 1 Bronze Fleur de Lis; Louisiana Recruiting Ribbon; Louisiana War Cross; Louisiana Cold War Victory Medal; Louisiana Emergency Service Ribbon with 3 Silver Fleur de Lis; Louisiana General Excellence Ribbon; and the Louisiana Longevity Ribbon with 1 Silver Fleur de Lis.